Over twelve years ago we brought Sadie into our home. I was in a Petco looking for kitty litter and there she was. She was being adopted out. They said she was around two and had been found dumped way out in the desert. She was a skinny, goofy looking lil girl. She reminded me of a newborn foal with long skinny legs and huge paws. She had Shepard, Chow and Chesapeake Retriever in her. [heinz 57 I say] She fit in our family like a glove. Over night she grew up into an 80 pound big girl. She was our protector and our friend. Sadie loved being outside and would sit in the middle of the lawn in the pouring rain or the 100 degree heat. She was the pack leader. What I will remember most about her, is that she was gentle and a big love bug. She was and will always be close to my heart. She will be coming home again to sit next to Beau and Emmy on my mantle. She is now free and no longer in pain. She can run again and I’m sure she is already chasing Beau. I know he met her at the bridge. She is forever young again. They all run and play together, but the day comes when one suddenly stops and looks into the distance. Their bright eyes are intent; Their eager body quivers. Suddenly he/she begins to run from the group, flying over the green grass, their legs carrying him/her faster and faster. Tracy…..I’m so sorry about Sadie. It’s so hard to lose our dear pets! Thoughts and prayers are with you and your family!! 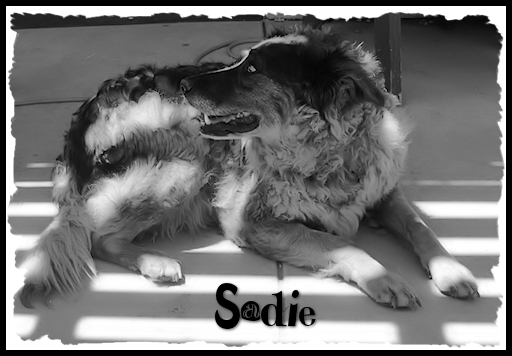 Sadie was a love match and she will always be with you. Much love and hugs to you and your family. Sadie was a pretty girl, and her fur siblings are waiting for her…I really love the rainbow bridge poem and remember when our vet sent us that poem when our Bran-Bran passed on, along with Whiskers and Berger (our cats) when they passed too.